What public-policy innovations can make cities better places to live? A large number of American cities—from New York to San Francisco—have experienced remarkable rebirths over the past 30 years. But their success has made housing less affordable and traffic congestion worse. Even America’s most successful cities contain large numbers of poorer citizens left behind by the urban renaissance. Can creative public policy reduce the downsides of density and improve economic opportunity in urban America? This collection of essays brings together the best ideas from scholars with expertise across a broad spectrum of urban issues. The common theme of the papers is to innovate, evaluate, and leverage the remarkable private talent that is so abundant in America’s great cities. Public capacity is sharply limited; the ingenuity of urban entrepreneurs seems practically boundless. Local governments should be more entrepreneurial and do more to use the talents of the entrepreneurs around them. The first two essays address two core problems that exist in almost all thriving cities: high housing costs and traffic congestion. New York was an affordable city in 1977 when it teetered on the verge of bankruptcy. As incomes have risen and crime has dropped, demand for urban space has soared. Because the supply of new homes has not kept pace, prices have risen dramatically. Housing costs are so high that even extremelysuccessful urbanites find them to be a burden, and the poor suffer even more. The whole city is hurt when high housing costs drive away talent and increase the wages that businesses need to pay to retain their workers. In Chapter 1, Ingrid Ellen delivers three clear recommendations for reducing the cost of living in America’s expensive cities. First, she follows the legendary Henry George and calls for a switch from property taxation to land taxation. A tax that scales up with the size of a building reduces the incentive to build big, which reduces the supply of new housing and raises prices. A tax that is tied to the value of the land beneath the building will push developers to get as much value out of that land as they can by building larger structures. Ellen’s second proposal is to eliminate minimum-parking requirements for new structures, something that Manhattan has already done. There is little reason to require builders to subsidize driving in urban America. It makes far more sense for them to build parking if their residents are willing to pay for that parking. Finally, to help the very poor, Ellen advocates spending less on homeless shelters and more on time-limited rental assistance, targeted toward those at risk of becoming homeless. At the very least, experimenting with such programs would provide us with more evidence about whether short-term assistance can reduce the risk of permanent homelessness. In Chapter 2, Matthew Kahn takes on the topic of urban mobility. Like many economists, Kahn believes that America’s cities should follow London and Singapore and do more with congestion pricing: charge drivers who drive on crowded city streets during peak hours. But his essay focuses on the public-transit side of urban mobility, especially making buses better. Kahn, like many transport economists, thinks that buses are the right solution for public transportation for cities that have medium-density levels and a desire for flexibility and innovation. One reason that America’s buses are so unloved is that federal law requires cities, if they want transportation-department dollars, to buy American-built buses. Just imagine if American car drivers faced the same constraint. Not only would every BMV aficionado or Camry lover be out of luck, but the American car industry would be much more of an old-fashioned cartel, with far worse products. Yet we don’t let our public bus companies get the best bus for the dollar. That means that buses are less cool, less energy-efficient, and less comfortable. Kahn argues that buses are far cheaper than rail lines and far more conducive toward innovation. Rail lines are set; buses can move as demand requires. Bus flexibility can be even stronger if there is a mix of private and public bus provision. The growth of private low-cost bus transport across metropolitan areas has been one of the great transportation success stories of the past two decades. There is no reason that more private-sector bus provision can’t also aid urban mobility. The general point is to ensure that urbanites have plenty of transit choices that reflect the heterogeneity of cities and their changing needs. The next two essays focus on the problem of enduring urban poverty. Education is widely seen as one of the few proven means of lifting poor children out of poverty. Indeed, the remarkable success of a few early preschool programs has generated a national push for early-childhood education that goes beyond Head Start. But Eric Hanushek, in Chapter 3, urges an approach that is more oriented toward experimentation and evaluation. Some early-childhood programs, such as Perry Preschool and Abcedarian, worked magic; but not every preschool program has been so effective. There is a healthy debate about the efficacy of Head Start. Just throwing money at an expanded preschool system may not achieve much, especially if the money has to come out of already strapped upper grades. Hanushek proposes that we must recognize that we don’t know what ingredients produce a cost-effective quality preschool. This ignorance argues for experimentation, evaluation, and pay-for-performance. Just as with buses, there are strong reasons to encourage both public and private provision. But in the case of small children, we can’t count on the market disciplining poorly performing programs; therefore, school compensation, particularly for private schools, should be tied to appropriately measured school outcomes. It is key to have consistent evaluation to determine what makes preschools more effective. In Chapter 4, I focus on the creation of districts within cities to encourage entrepreneurship in lower-income areas. These districts are not meant to bribe people to locate in poor areas. Instead, they should be low-cost; if they work, they should be expanded. The reason to begin with a district rather than an entire city is, again, humility: we don’t know what works, and we have to start with policies that let us learn. An entrepreneurship district should have two core elements: first, regulatory relief and one-stop permitting. Too many of our cities have erected too many barriers to starting new businesses, and the process of getting started can be a painful maze. It would be far better to have a single permitting czar in the district, in charge of assembling all permits for every business. The permitting chief can then be judged on the speed with which applications are handled. Second, the district should have a training component, for young adults and older teenagers, delivering skills that are tied to entrepreneurship. One type of training might focus on teaching the basics of entrepreneurship. A second type could focus on vocational skills that entrepreneurs demand. In all cases, the programs should include components of randomization and evaluation because we don’t currently know what works. Only by a constant process of innovation and evaluation can we learn how to connect more young urbanites with the labor market. 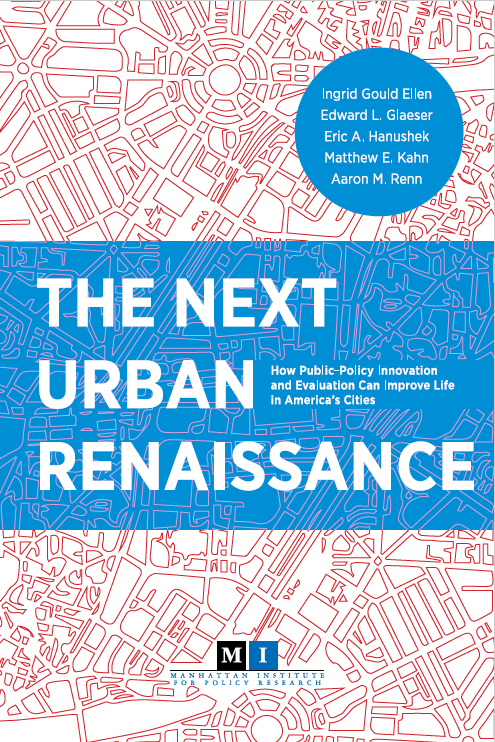 In Chapter 5, Aaron Renn argues that cities should worry far less about brain drain. Instead, they should recognize that cities benefit from the connections that migration creates. A far better set of policies would encourage the emigrants to remain connected with their old home and to consider a return home later. Cities are not islands, and people who move bring ideas with them. A city can benefit greatly from a migrant who leaves and comes back. These essays fit together. They all argue for urban-policy innovation that recognizes that good government means respecting the power of private initiative. Ellen wants to encourage private development. Kahn and Hanushek argue for private provision of buses and preschool programs, respectively. My essay is all about private entrepreneurship as a tool for economic mobility. Renn focuses on using nonpublic talent wisely. They all make the case for public experimentation. We don’t know the answers to the hardest problems, and we shouldn’t pretend that we do. Instead, the public sector needs to behave more like a nimble start-up than a stately bureaucracy. The goal is to try new ideas, evaluate them, and then take the best and reject the worst. Cities have a tremendous capacity for innovation. Their modest size makes them the true laboratories of democracy. But to live up to those words, they need to embrace experimentation and evaluation.